Parents on Nevis have been urged to take advantage of every opportunity they receive to get their children tested. The advice came from Minister of Health in the Nevis Island Administration (NIA) Hon. 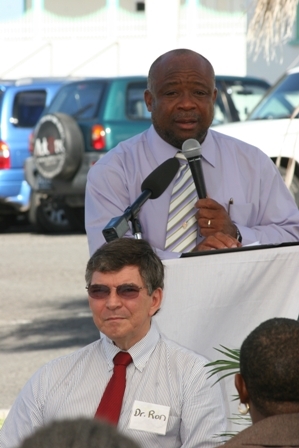 Hensley Daniel when he delivered remarks to mark the official opening of a Hearing Aid Mission at the Alexandra Hospital on Monday. The event was organised by the Florida based Caribbean Foundation For Children Inc.
“Take every opportunity to get your children screened and tested…if you did this testing in the United States and other capitals around the world it would be far more expensive. “Very often in Nevis the services are provided at a very cheap rate or most times at no cost at all and if the parents don’t access the service, then it becomes much more difficult to provide the curative care years after,” he said. The Health Minister also warned parents against uncertainty with regard to their children’s health status and encouraged them to not be ashamed if something was wrong. He said early detection of health problems in children was as important as taking early corrective measures. “We have to be fortunate that we have at our disposal the Caribbean Foundation For Children, the Ministry of Education and the Ministry of Health and the [ear] Specialist Dr. Brouillette who can help us. “So make good use of it and I trust that all of our children who are screened will be certified as having proper hearing or if they don’t, that they can be helped and helped immediately. The Ministry of Health stands ready to help in that regard,” he said. A number of students who had been identified to receive the screening test came from a cross section of Nevis Primary Schools. At the end of Wednesday’s session over 100 students had been examined.